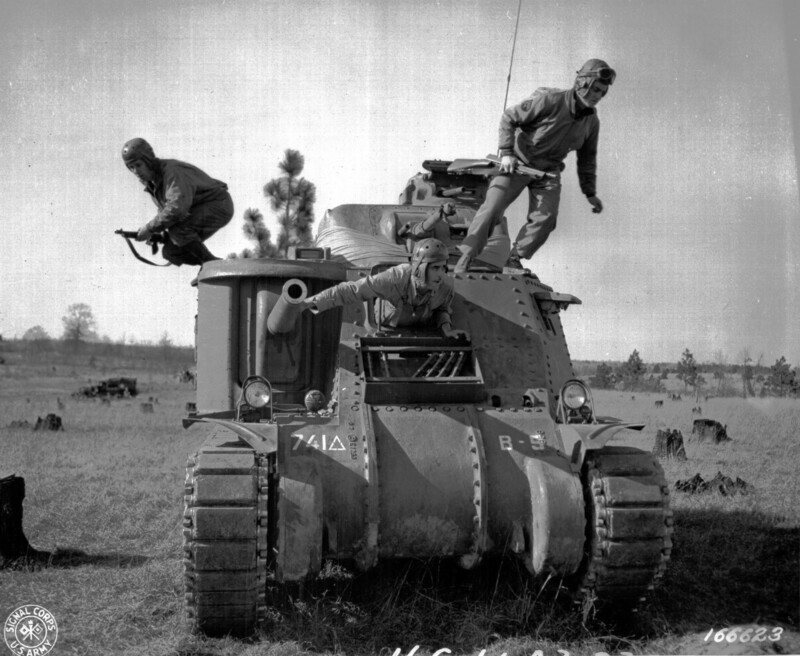 There were two types of tank battalion, the type attached to infantry divisions, as ‘independent’ tank battalions, and the type that were a part of an armored division. They were pretty much the same in organization, if not in how they were used. The life of a tanker could vary wildly from another’s depending on where he got assigned, and the tamest would probably be when they got sent to an armored division. Let’s start with the smallest sub unit of the Tank Battalion, The tank platoon. A Lee tank platoon in North Africa, or training in the US would have (1) Officer, (9) NCOs and (25) enlisted men. Later this would be reduced by five enlisted as the radio operator was dropped. In the US the tanks could be several kinds of Lee, but the units that deployed with M3 Lee tanks for Torch, were M3 Lee models with the R975 powering it. The Lee was pretty short lived in US Service, and the US only took them into combat because there was a shortage of Shermans because of British needs, but once supplies were up, they US removed them, even from training. Many got shipped to the Australians. 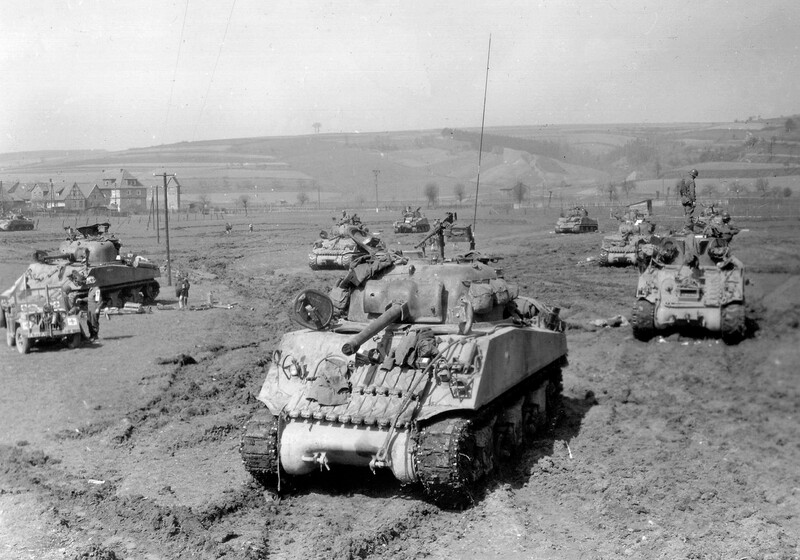 A Sherman platoon would be made up of five Sherman tanks, Early in the war, M4s and M4A1 75 tanks, by late 44, they might be a mix of M4 75s, M4A1 75s, M4A3 75w tanks and M4A1 and M4A3 76 tanks, though some units kept all 75mm tanks. The likely mix would be some M4A3 75 tanks, and M4A3 76 tanks, with some M4A1 76s mixed in with some small hatch M4s and M4A3s. The optimal number of men for a tank platoon is 25, (1) Officer, (9) NCOs, and (15) regular GIs. These men would be permanently assigned to one of the tanks. 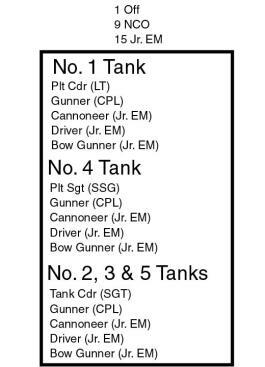 In most cases the tanks were named, and the name reflected the platoons, company designation, for this example we’ll say the platoon belongs to B Company, so all five tanks will be named something starting in B. In the field, the tank would be home, and they would sleep under its tarp next to it, or in it if they were paranoid. The men of a tank platoon would be very close, as they would spend a lot of time with each other. No. 1 Brenda: M4A3 76w, Platoon leader, Commander by a Lieutenant, Gunner: Corporal, Loader, Driver and Co Driver: Jr enlisted. New tank has commander’s radios. No. 3 Battlingbitch: M4A1 76w, Commander by a Sargent Gunner: Corporal, Loader, Driver and Co Driver: Jr enlisted. This tank has been around since Cobra. No. 4 Bronco: M4A3 75, Commander by a Staff Sargent Gunner: Corporal, Loader, Driver and Co Driver: Jr enlisted. Another small hatch survivor, has all updates, and C/O radio. No. 5 BettyW: M4A1 75, Commander by a sergeant, Gunner: Corporal, Loader, Driver and Co Driver: Jr enlisted. This tank is a small hatch survivor. This was as small as the unit was broken down in an Armored Division, at least most of the time. In a separate tank battalion things would be different. 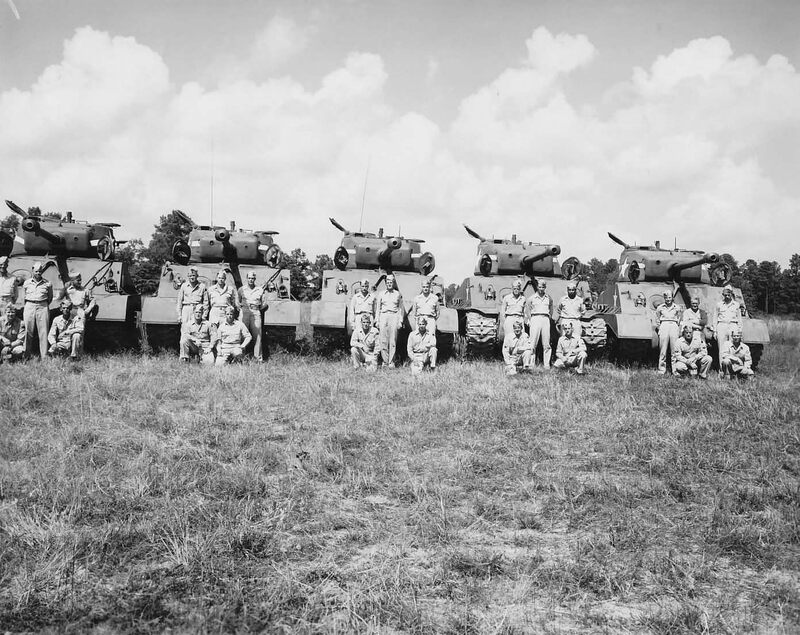 Often a battalion would be assigned to an infantry division for an extended period of time, a few the divisions the entire war, and they used tanks differently. 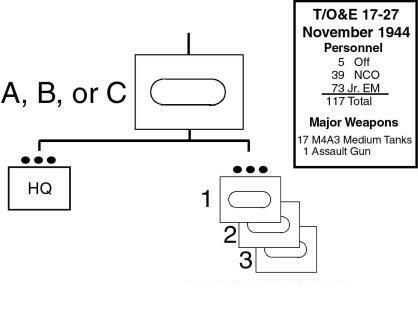 Sometime assigning two tanks to a company of infantry, or three, two tanks was called a Light Section, three a Heavy Section, and that was as small as the tankers wanted to go, but sometimes even single tanks could be working with a couple of platoons of infantry more than their partner tank. In a separate tank battalion, once assigned to a division for battle they were often broken down much further. The way they usually did it was each regiment of the division would get a company, and then each battalion of the regiment got a platoon. The HQ platoon would be held in reserve or used to beef up a special combat team. One tank platoon could get to know a battalion of troops very well if they worked together often, and that made for a better team. The longer they stayed assigned together the closer that bond got. Some Army officers even encouraged the exchange of men in bivouac, so infantry and tankers could see how the others lived. The next unit up in the Battalion is the Medium Tank Company. 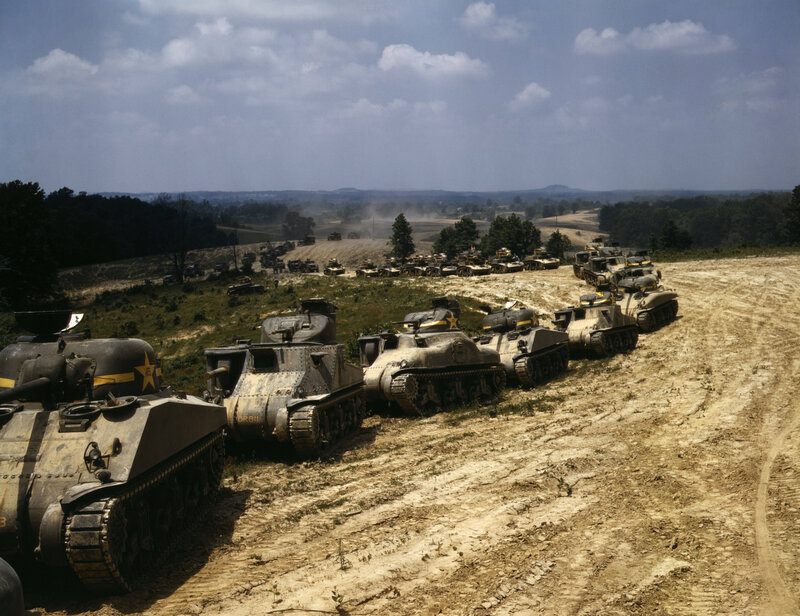 An early war US Medium Tank Company was made up of 3 tank platoons containing 5 Lee tanks, and an HQ platoon with 2 more Lee tanks, and 1 jeep and 1, M2 halftrack. They also had an Admin and Mess platoon, with 2, 2 ½ ton trucks, 1, 2 ½ Kitchen truck, and 1 self-propelled 37mm GMC. Last but not least, a Maintenance platoon, made up of 2 M3 Halftracks with winches, and 1 Jeep. To run this outfit, you needed 5 officers, and 144 enlisted men, including 40 NCOs, but it was pretty primitive compared to the later TO&E. 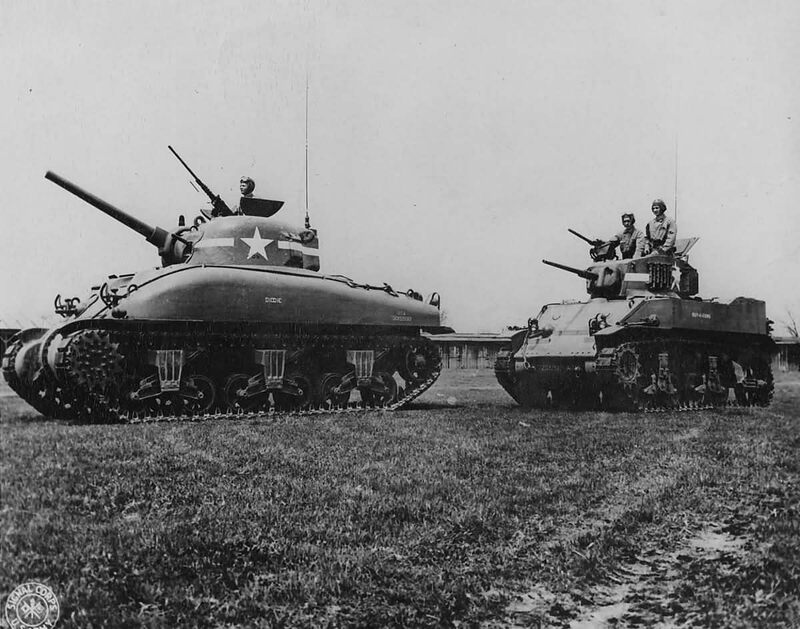 A later war Sherman Company is made up of three Platoons, just like the example we just talked about and a headquarters platoon with two gun tanks and a M4, or M4A3 105 tank or M7 Priest. The unit has shrunk a little, B Company has 5 Officers, 39 NCOs, and 73 Jr. EMs The HQ Platoon had three tanks, a pair of M4 tanks of any 75/76 variety for the Company Commander and 1st Sargent. The third tank would be a M4A3 105 tank or an M7 priest if the 105 tank was in short supply. The HQ platoon would also have ARV assigned. It would also have a maintenance section and admin, mess and supply section attached. This part of the company HQ would have their own trucks and jeeps and would hang back with the ARV and the 105 tank while the fighting was going on. Sometimes the truck would run ammo out to a tank or the ARV would move out to get a tank unstuck or deal with another problem of that type. It would not be uncommon for the men in the HQ platoon not assigned to the combat vehicles to not see the rest of the men in the company for weeks at a time when assigned to a separate tank battalion. When part of an armored division, the companies worked together, and the company commander would lead his company into battle. One of the main differences here are the 105 tanks or M7 Priests and the Tank ARV, that the early company lacked. They had fewer trucks though, since they were moved into the battalion Service company. Now is as good a time as any to talk about the light tank company. Early in the war, when the Lee was the main tank, no light tanks were included in the tank battalion TO&E, but they were added by 1943. 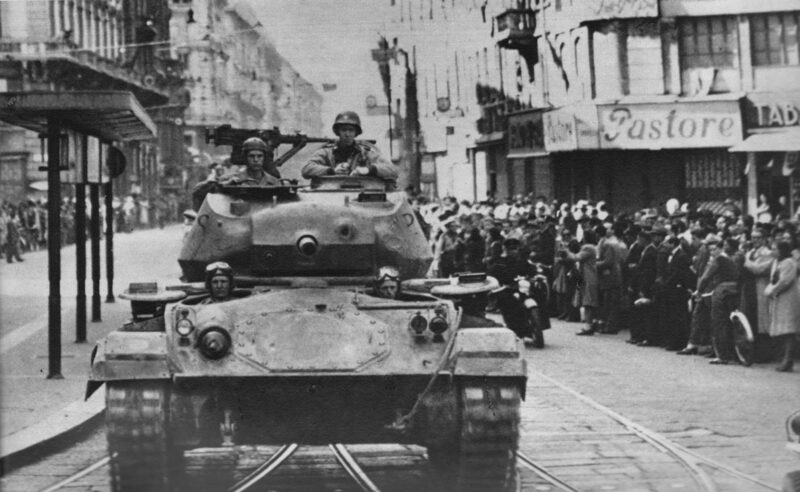 So from 1943 onward, the tank battalion had four combat companies, three of medium tanks and one of lights. There were also light tank battalions that had all light tank companies. The light tank company was configured more or less the same way as the medium tank company, three platoons of five tanks, with two HQ platoon tanks. They was they were used was very different. Even early in the war in North Africa, the light tanks armed with 37mm guns were having trouble. When used in the recon role they had to rely on speed alone to get them out of trouble since the gun wasn’t very useful against anything but the lightest of armor. They were fast, and they had lots of machine guns, so they could be used, to a degree against soft targets, so they were used for rear security, messenger duty, and screen flanks and scouting. They would be useful against infantry without good AT weapons. Late in the war when the M24 Chaffee started showing up, these light tank companies really got some teeth, in a very nice little package. The M24 had a 75mm gun that was an improved version of the M3 75mm gun, and had a concentric recoil system. Once they got the new light tank they probably took scouting duties back on to some degree, but even the Chaffee was a light tank, and all sorts of AT weapons knocked them out pretty easily. AM&S Section: (1) 2 ½ ton truck with trailer. When you look at the tank battalion and compare the early Lee tank battalion to a later Sherman one, there are some very big differences. This stemmed from the lessons learned fighting these units in North Africa. The size of the battalion grew overall but some units got a little smaller. This was not a small unit, but by 1943 it had grown a lot. The new TO&E has a whole new Light tank Company and Service company really fills the unit out. 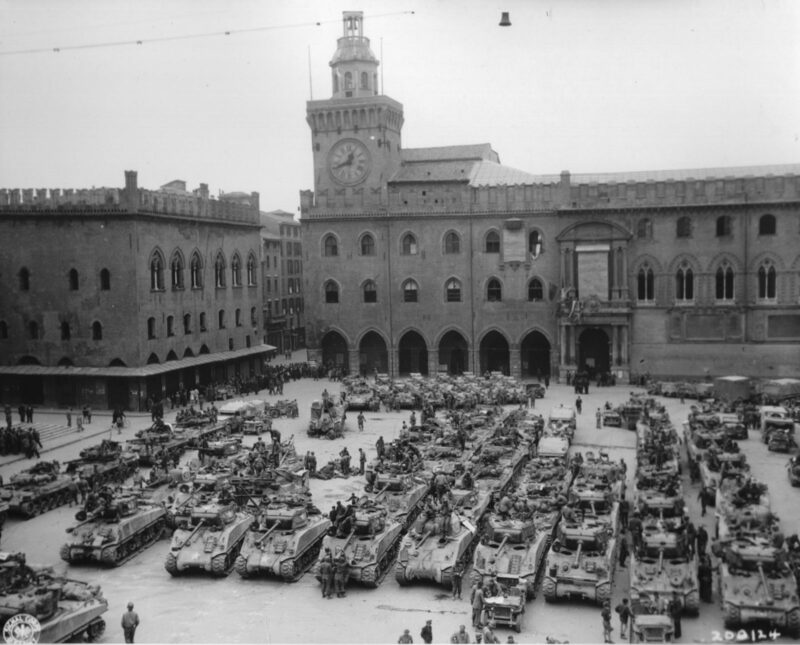 This image is of the 752nd Tank Battalion in Bologna Italy. They are in the Plaza Emanuel and it still looks like that too this day. I found the info for the image on the Sherman Minutia site, along with a much larger version. This was the whole kit and caboodle, three medium tank companies, one light, six assault guns, and a service company with three more ARVs. In an AD, all these units would work and train with each other for years. There weren’t that many revisions to the way ADs were configured, so the same units would stay in the same Armored Division for years or the whole war. There would also be a fair amount of competition, not only among the battalions, but amongst the companies in the battalions. They would also have a chance to work with the same Armored Infantry Battalions, and the tank infantry team tactics would become ingrained, and they would have far less trouble working together than many of the independent tank battalions. They also had no issues with supply, since they were part of the divisions supply system. The independent battalions had a tougher life in many cases. Many got moved around from Infantry Division to Infantry Division, and how well the infantry knew to work with the tanks varied a lot. This could mean the infantry officers may not know the best way to employ armor and would often ask the tankers to things that a tanker knew was suicidal. This sometimes resulted in the tanks being forced into attacking infantry in towns, or even just dug in positions alone, and in the few cases they succeeded, if they were not relieved or supplemented by infantry, they would be pushed off the objective by being overwhelmed by sneaky infantry who can surround tanks without support. They also spent more time on the line than the AD battalions. They also had to order they supplies, including spare parts through the ID they were attached too, and if the ID supply officers had no experience with this, shortages could take place. The experiences of the independent battalions really varied though. Some worked with the same ID the whole war, others got moved around so much no one got used to them or vice versa, and of course there was a range of experience in between. Often though, the independents, rarely worked in more than platoon size groups, and the only time they would see each other on a regular basis is if they were supporting units in the same fights, or after the battles when the units went into the reserve to rebuild, but in many cases, this is where the tank battalion was detached and sent to another ID in combat. According to my dad’s WD-AGO, he was wounded twice in the first half of January, ’45 while his CC (a part of 6th Armored Div) was attacking east of Bastogne. He said he was clinging to the back deck of a Sherman tank both times. How common was it to order the infantry to do that? Did the typical Sherman have hand holds welded to the back deck? There are darn few surviving photos of US armored infantry doing that.